This problem is my own on my Acer Desktop with Windows 7 64-bit. I wrote once before that when I start up my computer there is always a red mark on my speaker icon. I have to click on it to open the volume bar, then click on the blue volume symbol to mute the sound, and then click on it again. Click Start, then type Services.msc in the Search box. Scroll down the list of services, find each of the services listed above, and Double-Click on it. Set it’s Startup Type to Automatic, if not already. If it is not running, click on the Start Button, or use the Start Link in the left column. Note: If it has not started and is not set to Automatic, set it to Automatic, then click on the Apply button and you should then be able to click on the Start button that otherwise might be greyed out. I have had to do this procedure on few PC’s I have worked on. 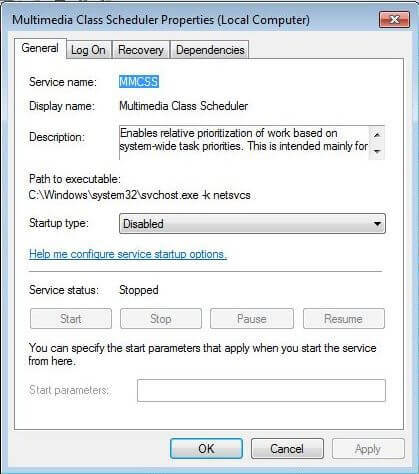 Just haven’t figured why a PC disables this service. I too had a sound problem when using Windows 10, after an update. Tried to uninstall several of the updated files, but with no success. With no solution, and the hardware being several years old, opted to replace the motherboard, processor and ram. Also degraded to Windows 8.1 and problem vanished, Mindblower! I have this problem with windows 10 also after and update but have Restore turned off lol. So I just plug external speakers in now. After a Windows 10 upgrade my speakers no longer work. When I plug my earphones in, there is sound so appears as if the computer is OK and audio still works. I suspect I need a new or updated driver for the speakers that are compliant with Windows 10. The speakers are old, cheap – Multimedia Speaker System HG1050. How do I get the driver? I suspect that will do the trick? Speakers don’t need drivers but you can try upgrading the sound drivers by typing Device Manger in th search bar and click on it to open. Click on the little triangle shape to open the Sound, video and game controllers section. Right click on whatever is listed under it after and in the menu that opens click on update driver. Otherwise right click on the speaker icon, down by clock, and then Open sound settings make sure to Choose your output device is selected to your speakers. Try each one listed to see if any works. While there you can click on the troubleshoot button. Otherwise it’s possible that your speakers gave out with nothing to do with the update. Unplug speakers from system and plug back in. Just a few suggestions. I tried it all. ” The best driver is installed” was the message when updating driver. Since I can hear the sound with the headphones the sound from the computer is OK leading me to believe it was the speakers. I opened the sound settings. I checked all output devices with the “speakers/headphones” the only one that worked. Finally I unplugged the speakers, nothing. So, maybe it is the speakers! When I get the chance I will borrow my wife’s to check and see it they work on my desktop. Hello wilson. When you tested with earphones and connected to the computer, did you use the same output as for your speakers? The the following if you answered NO. 1) that the power cord for the speaker is in, light on the speaker as well. 2) the volume control is working and set above a very low or mute position. 3) the wire from the speaker(s) is plugged correctly into the computer (not disconnected) or in the wrong slot. 4) and you are the only person who can access the system. You might surprise yourself, Mindblower! I was informed that speakers don’t need drivers so that’s not the issue. Hear fine with the headphones so the sound from the computer is OK. I checked power, cables, replugged and checked all slots. Maybe my speakers are just done? Right click on the system tray speaker icon/click on playback devices and click the speakers you wish to hear sound from. Mine are set on Realtek High Definition Audio. I use a sound card on a couple of my machines and I have to choose the sound card for audio. I also have had to do this on a few machines that I have installed W10 on. You may also want to click on your speakers and click on configure and run the test.